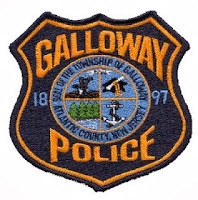 Galloway Township Police responded to 737 calls for service during March 16, 2014 through March 22, 2014. Additional statistics include: 2 Burglaries, 13 Motor Vehicle Accidents, 51 Tickets issued, 5 Driving While Intoxicated, 26 Arrests, 11 Domestic Violence,10 Fire Calls, 70 EMS Calls and 3 Juvenile call. Sergio Carranza-Ramirez, 19 of Long Branch, was arrested for DWI by Ofc. Crocker on March 16. Brian Chinnici, 36 of Staten Island, NY was arrested for DWI by Ofc. Welsh on March 16. Mathew D Martin, 19 of Galloway was arrested for theft by Cpl John Kelly on March 17. Torri E Stevenson, 22 of Linwood was arrested for DWI by Ofc. Gorneau on March 18. Doreen M Palmieri, 55 of Galloway was arrested for DWI by Ofc. Gorneau on March 18. Michael Z Takach, 18 of Galloway, was arrested for DWI by Ofc. Ceci on March 19. Karen M Fiore, 34 of Galloway was arrested for 3 counts of possession of CDS by Ofc. Kuhar on March 21. Monica M Hillesheim, 18 of Galloway was arrested for possession of 50 grams or less of marijuana and possession of drug paraphernalia by Ofc. Gorneau on March 22. Ivan J Solano, 18 of Galloway was arrested for possession of 50 grams or less of marijuana and possession of drug paraphernalia by Ofc. Gorneau on March 22. A 16 y/o male was charged with possession of CDS, manufacture/distribute CDS by Ofc. Mulholland on March 19. A 14 y/o male and two 15 y/o male of Galloway were charged with receiving stolen property by Ofc. Welsh on March 20. A 14 y/o male and a 17 y/o male from Pleasantville were charged with robbery and conspiracy to commit robbery by Det. Kiamos and Det. Casey on March 22.